President Trump on Friday released a statement condemning Russia for violating the Nuclear arms treaty and signaling the U.S. withdrawal from it. 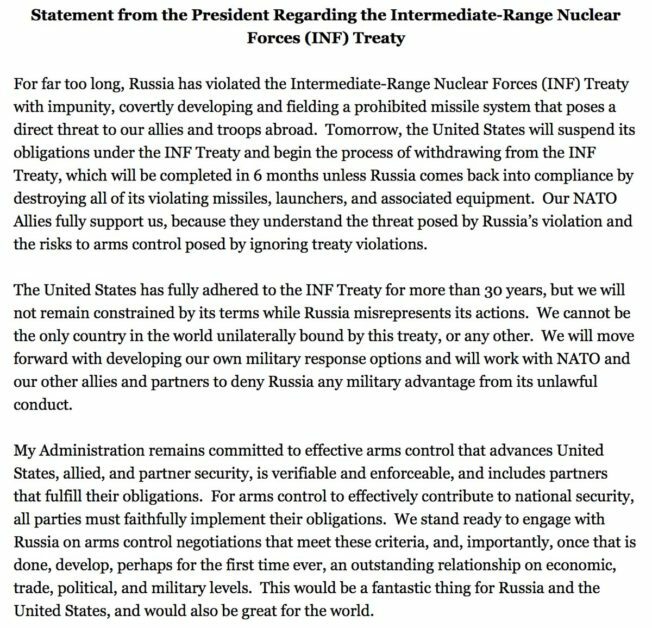 The United States has fully adhered to the INF Treaty for more than 3o years, but we will not remain constrained by its terms while Russia misrepresents its actions. We cannot be the only country in the world unilaterally bound by this treaty, or any other. We will move forward with developing our own military response options and will work with NATO and our other allies and partners to deny Russia any military advantage from its unlawful conduct. My Administration remains committed to effective arms control that advances the United States, allied, and partner security is verifiable and enforceable and includes partners that fulfill their obligations. For arms control to effectively contribute to national security, all parties must faithfully implement their obligations. We stand ready to engage with Russia on arms control negotiations that meet these criteria, and, importantly, once that is done, develop, perhaps for the first time ever, an outstanding relationship on economic, trade, political, and military levels. This would be a fantastic thing for Russia and the United States, and would also be great for the world.